Exploring love, temptation, fear and guilt—in these psalms you will find medicine for your soul. How often do you get the tune of a mindless song stuck in your head? It’s one way that Christians can end up thinking and wanting things just like the world around us. So God has given us a collection of songs that can help us re-tune our hearts to what He thinks and wants instead. You may feel as if your soul is downcast or sick — troubled by worry, sin, suffering, fear or guilt. David, the Israelite king who wrote many of these songs, tells us that the Word of God revives the soul — it’s powerful stuff! And how to revive your soul is the theme of this selection. Mostly written by people rolling in trouble, they take us from the problems we face, and turn us back to God, the rock. In these psalms you will find medicine for your soul. Learn to fear God instead of others, to trust Him in difficult times and to sing a new song to the God who saves. At the moment, I am using this book for my own devotions. I am finding this book to be a great way to get back some clarity and confidence of how God helps, loves, and teaches us as we go through the life experiences covered in this book. It has it's challenges too and it will encourage growth and maturity in your walk with God. I recommend this book both for personal and group study. The study guides are perfect for individual and also for groups. Questions are designed for the reader(s) to think deeper and understand how relevant the entire bible is to our own lives. This is our fifth Good Book Company study we have used in our ladies group. We have really loved the clear format and the thought provoking questions and found that our discussions have really flowed. As the leader, I really enjoyed the choice of Psalms picked in this study but I found the direction taken often confusing and there was less guidance in the back. I found I had to reshape the questions and had to rely on other commentaries to get a more thorough understanding. I know that the studies were more a thematic journey and maybe that was my stumbling block. The shorter 6 week study did work for our group of international mums and it didn't feel too overwhelming. 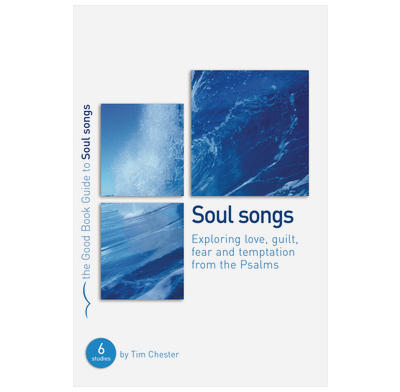 Soul Songs has proved o be a stimulating resource for our newly formed small group. There is a good variety and quantity of questions from which to select according to the needs of the group. We found that we could go in deep to look at the passage in context, or find he questions that really got people to apply it to their lives. It was inspiring to look at the dark side of our emotions and how the Psalms explore them, as well as the positive side. We found this very helpful with our women's Bible Study Group. The studies are simple and clear, without (thankfully) long bits of explanation to read out. The studies do well in applying the Old Testament in a thoroughly Christ-centred way, and focusing on grace rather than a "try harder to be like David" mentality! They are very pastoral, although occasionally they focussed too much on the issue Tim Chester was trying to address rather than the biblical material. I would highly recommend them though, especially for a group of less mature or less academic Christians. Our group have enjoyed looking at Psalms in this way and we have managed to get quite a lot out of them. It has been refreshing and challenging. One or two of the group have pointed out that some of the questions are repetitive and overly simple, but it possible to get round that. I have used Good Book Guides quite extensively with two groups and have mainly found the material excellent. Just one comment to make though - it would be helpful if the Leaders Notes were in a separate book, as we find sometimes, instead of thinking things through in the group, the "answers" from the back are just trotted out without much thought, and I like to encourage people to think for themselves! The notes explore the main points of the Psalms chosen and provide useful questions for understanding the passage and applying it to life. Good for invidual or group study and can be adapted for youth. This study book is refreshing and just as good as other Tim Chester study guides. Our group have enjoyed finding why the Psalms were written, the circumstances and bible passage that may relate to them being written and how they are SO relevant to us today. It helps us study the bible with more understanding and be encouraged to see just how God uses ordinary people like us, despite their past or present situations in life. Only one thing I would say as a down side, is that sometimes questions may repeat themselves, or maybe we just hurry on too far and dont think deep enough. But the positive encouragement we have received far outweghs this minor thing. This is a most interesting selection of Psalms put together to provide a very challenging study. We are part way through in our Home group but already the first few sessions have provoke some stimulating debate and some deep discussions. Using this book with a group of mixed age and experience and it is helping the Bible speak to us all. Useful to have the places to write in, as I can encourage people to go away and think over what we've said and discovered and write down their personal thoughts for themselves.